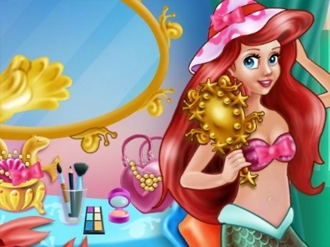 In this princess game you are the only help she gets and her salvation, that why you have to get her out of trouble. Clean the castle room before anyone could see her and dress her up for the future event. Follow the instructions and start cleaning the mess step by step. Accomplish all the tasks and get the princess ready choosing her a cute outfit with matches accessories and pretty shoes on. Rapunzel had a party at home last night and this morning the guests left. Rapunzel's house is a real mess and she has to clean it up fast. It will take a while if she will do it all alone, so will you help her? 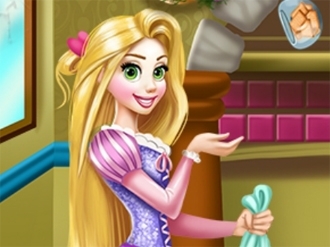 Play this game and move quickly to get rid of garbage, remove dust and the spots from the floor and put everything back to it's place, so Rapunzel can finish the cleanliness in no time. The Halloween is coming! Peppa pig and her family want to decorate their house in Halloween style! Let's help them! Sofia could use some help to clean her castle. There is so much trash on the floor and on the tables that will take ages to clean. Can you help Sofia? Use the broom and mop to clean the floor and the brush to clean the tables. Gather the trash and put it in the right trash can so it can be recycled. Sofia will be grateful for your precious help. Enjoy!